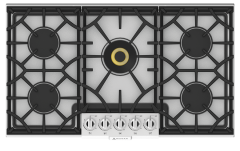 Sealed center power burner provides 20,000 BTUs of high-performance cooking power. Pro-simmer maintains delicate simmering with a gentle and consistent flame. Backlit knobs and Hestan signature control panel enhance both visibility and style. Special red illumination function indicates when burner/grate is still hot. Hestan’s sealed center power burner provides 20,000 BTUs of high-performance cooking power. Hestan’s pro-simmer maintains delicate simmering with a gentle and consistent flame. Backlit knobs and Hestan signature control panel enhance both visibility and style.